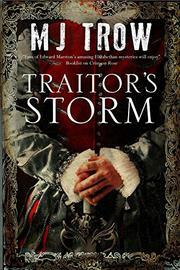 Christopher Marlowe finds inspiration and intrigue in the threat of a Spanish invasion. Spymaster Sir Francis Walsingham, suspecting a cuckoo in the nest on the Isle of Wight, dispatches Kit Marlowe—playwright, poet and spy—to find missing agent Harry Hasler and help flush out the traitor. The island, perilously close to the continent, is in danger of King Philip of Spain’s darling project: the invasion of England with his mighty fleet. The possibility that the Armada will make landfall on the Wight makes Marlowe’s mission urgent. Under the guise of Writer in Residence to Wight’s governor, Sir George Carey, cousin of Queen Elizabeth, Marlowe sails to the island and steps off the boat into a mystery. A man’s body has been found headfirst in a drain in Bottom Field. The decedent is not, as Marlowe fears, the missing Hasler, but local landowner/toady Walter Hunnybun. The unfortunate Hunnybun doesn’t even get a grave to himself; preceding him is another corpse, a freshly murdered lawyer who had a closer connection to Sir George than the governor knows. Those two deaths are only the most recent under Carey’s watch. While Marlowe’s trying to find Hasler and identify the killer, he must also prepare a masque at Carey’s request, create a suitable part for Carey’s redoubtable sister and ghostwrite a speech for Queen Elizabeth. During his undercover efforts to learn who’s loyal, who’s not, and what’s been written in a secret code, the watch is out for Spanish sails in an island adventure that gives Marlowe the inspiration for a play to rival that of one Master Shaxsper. Trow (Silent Court, 2012, etc.) brings back Marlowe for another bawdy and loosely historical caper. Scattered anachronisms and inaccuracies don’t detract from this Tudor undertaking nearly as much as the hero, who remains something of a cipher.